Along with SQLPASS Summit 2010 announcements on SQL Server “Denali” features the MSDN site has published preliminary content on some of these features. Going over the “HADR” Overview (SQL Server) content we can get an early idea about this feature. 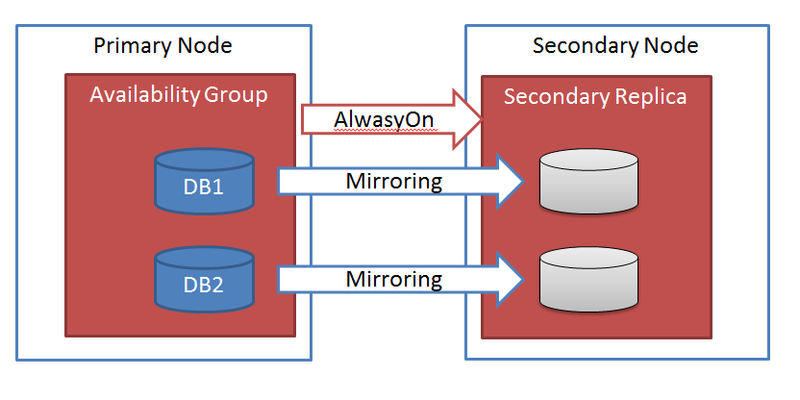 This post summarizes the AlwaysOn technology, and compares it with its predecessor and close cousin, Database Mirroring. For brevity, I am intentionally omitting a lot of details. Databases with dependencies on one another fail over together, as a group. AlwaysOn will allow for multiple standby replicas for each availability group. The standby replicas are accessible for read-only operations. But often application are deployed on several databases contained in an instance and there are tight dependencies between them (eg. cross database queries and procedures). With DBM one had to set up complicated logic to force failover of all related databases if one individual database was occurring a failover event. AlwaysOn introduces Availability Groups that allows explicit declaration of such dependencies. A failover occurs always as an entire group, all databases in the group fail over together become available on the new primary host. Database Mirroring is a private affair between two hosts. A mirroring session can only have on Principal and one Mirror, and they can switch roles. From a High Availability point of view the risk involved in losing one of the partner was fairly serious. Until the operations were set in place to either add a new partner or bring back the old partner online, the system would run at the risk of loosing availability on any further incident. With AlwaysOn there can be multiple stand-by secondary availability groups, on multiple hosts. This allows for a much safer operations, where multiple failures could be survived without loss of availability. This reduces the cost of achieving ‘five nines’ availability numbers, and eases planning, deployment and operating of mission critical systems. 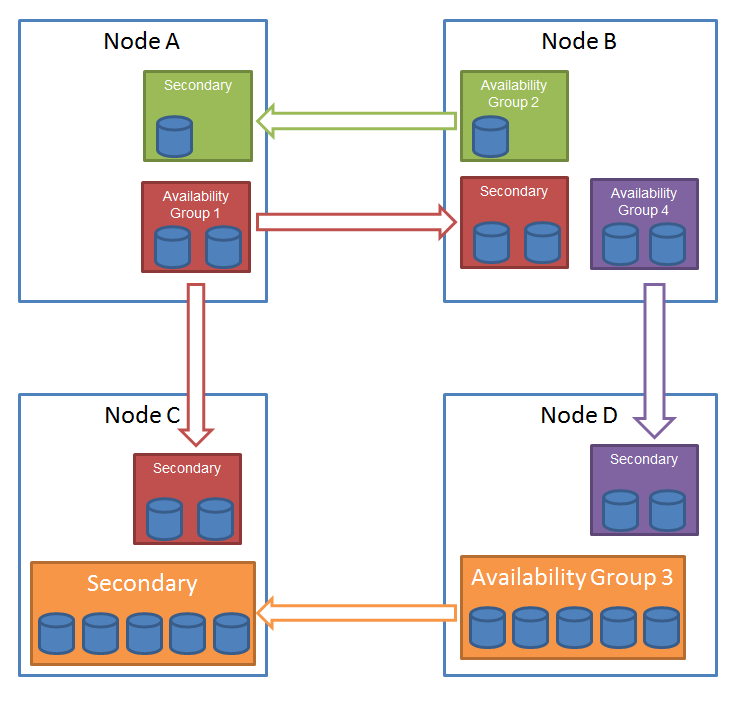 Availability Group 1 contains 2 databases and 3 nodes of the cluster have joined this availability group. 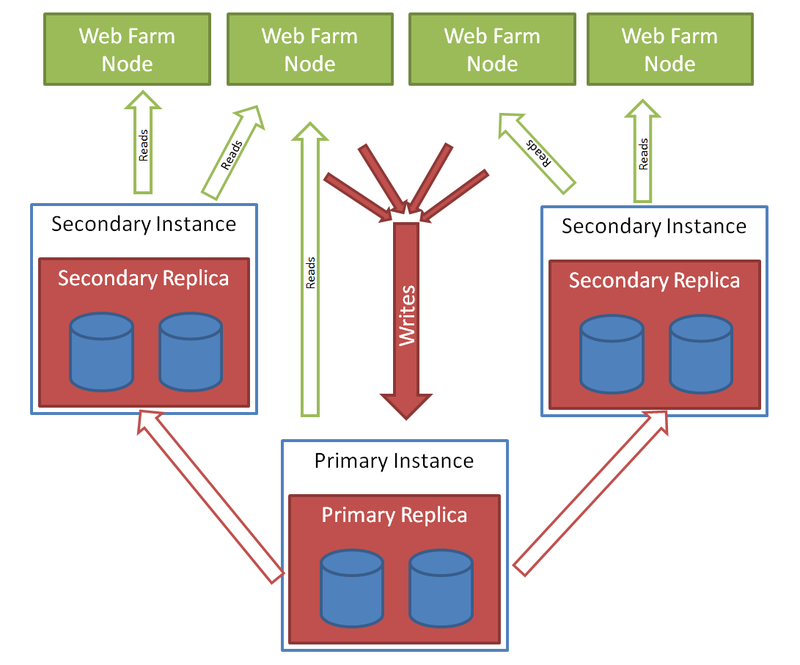 The SQL Server instance on node A is the the primary replica and the ones nodes B and C each host an availability replica. Availability Group 2 contains one database, it has the primary availability group running on the SQL Server instance on node B of the cluster and an availability secondary replica on the instance on node A of the cluster. Availability Group 3 contains five databases, it has the primary availability group running on the SQL Server instance on node D of the cluster and an availability secondary replica on the instance on node C of the cluster. Availability Group 4 contains two databases, it has the primary availability group running on the SQL Server instance on node B of the cluster and an availability secondary replica on the instance on node D of the cluster. Secondary replicas are readable in real-time. All read-only operations are allowed on databases in the secondary availability groups. Coupled with the capability to have multiple secondaries, this gives a very nice solution for Scale Out reads. Unlike Database Mirroring database snapshot solution, that was giving a point-in-time snapshot view of the database, readable secondaries allow for real query access to the content of the secondary database, in real-time for up-to-date changes. Access is read-only, no updates are permitted, and all queries run automatically under snapshot isolation model (lock hints and explicitly set isolation levels are ignored). The queries always get a transactionally consistent view of the data, as fresh as allowed by the underlying mirroring session that continuously updates the database. With synchronous mirroring this means that the scale-out achieves the all elusive golden standard of reads that are always perfectly consistent with the last committed writes *on any replica*, with no lag! So far this was impossible to achieve with any other scale-out technology [Correction 11/22: As Gopal points out bellow, this is still not achievable because synchronous mirroring only requires the shipped log to be hardened to disk, not redone. You can get pretty close, but but the application still needs to be prepared to handle stale reads]. Database Mirroring has always been a viable choice for small businesses. Available in Standard Edition, running on commodity hardware and with minimal licensing cost requirements, it was basically dirt cheap to implement. AlwaysOn is on a different league. Its availability is no longer based on quorum decided by a witness, as in Database Mirroring, but instead is based on Windows Server Failover Clustering. WSFC is a premium feature available only on Enterprise and DataCenter editions of the Windows Server family, and is supported only on hardware that has passed the Validate a Configuration Wizard. Small businesses can still deploy basic Database Mirroring, but they will have to support a significantly higher entry cost to enjoy the advantages of the AlwaysOn technology. Even with synchronous availability mode, the consistency of the data will still lag a little bit and is not in perfect synchronization with the primary. This is because the synchronous commit only require the logs to be hardened synchronously. Once the log is hardened there is an asyncronous process that does the redo of the pages using the hardened log to keep the pages consistent. For readable secondary the freshness of the data is reflected only after the redo. Having said that on a well tuned system the redo process is very close to real time. So the freshness of data will also be very close to real time. Unbelievable Article, Thanks for posting this together. I was looking for test scenarios for my test environment. Your write is so descriptive, I got answers to most of my questions. – How to implement Availability Groups in SQL Server Denali.